EXTENDED DOUBLE BAYED SEMI DETACHED FAMILY HOME located in a desirable cul-de-sac position, falling within Northgate high school catchment (subject to availability). 0.1 miles away from the local Co-op off Colchester Road. 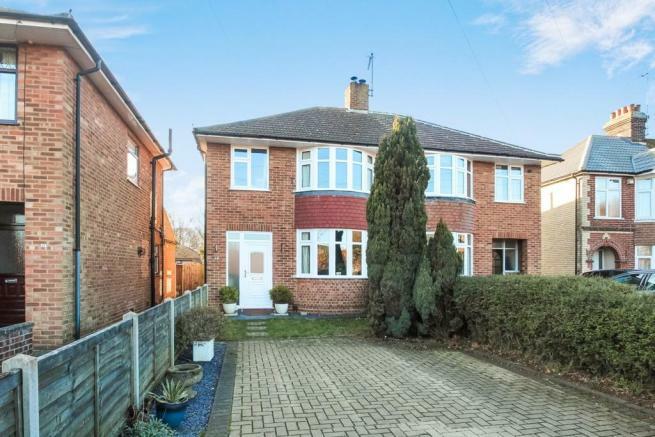 1.9 miles away from the Ipswich Hospital and just under 2 miles away from Christchurch park boasting pleasant walks and enclosed children's play area. This accommodation benefits from a kitchen/diner, lounge, sun room, three first floor bedrooms and family bathroom. There is a driveway providing off road parking along with a garage at the rear of the property. Hedge to side. Panelled fencing to side. Block paved driveway providing off road parking with purple slate border. Lawn area. Double glazed bay window to front. Coved ceiling. Radiator. Feature fireplace with open fire. Double glazed french doors opening on to the rear garden. Double glazed windows to sides. Laminate style flooring. Double glazed window to front. Two built in wardrobes. Coved ceiling. Elongated radiator. Double glazed window to rear. Radiator. Coved ceiling. Double glazed window to rear. Panelled bath with shower over and glass screen. Low-level WC. Vanity wash hand basin. Laminate style flooring. Part tiled walls. Heated towel rail. South westerly facing. Panelled fencing to sides. Laid to lawn with mature plants, shrubs and trees. Raised vegetable patch. Side access to front. Shed. Decking area. Up and over door. Insulated with heating. Power and light. Window and door to side. Disclaimer - Property reference 13550642. The information displayed about this property comprises a property advertisement. Rightmove.co.uk makes no warranty as to the accuracy or completeness of the advertisement or any linked or associated information, and Rightmove has no control over the content. This property advertisement does not constitute property particulars. The information is provided and maintained by Marks & Mann Estate Agents Ltd, Ipswich. Please contact the selling agent or developer directly to obtain any information which may be available under the terms of The Energy Performance of Buildings (Certificates and Inspections) (England and Wales) Regulations 2007 or the Home Report if in relation to a residential property in Scotland.